My dear friend, and early mentor, Vivian Andersen of Kensington Church Street has died aged 86. Viv, merchant seaman, magicians assistant, synchronised swimming troupe manager, civil engineer, hang glider and antiques dealer, had owned and run Lacquer Chest with his wife Gretchen since the 1950s. The shop is a London institution. For a husband and wife to run any business together requires a special chemistry. The dynamic of operating a thriving antiques shop together would lead a saint to reach for the chill out pills. In truth Lacquer Chest was always Gretchen`s passion. She loved the chase, she loved the shop, and she still loves the deal sixty years on. It was Gretchen`s idea to take it on and she rapidly filled it with an apparently random selection of pottery and enamel ware fulfilling a look which is best described as Plain English. The rent was £125 per annum. Viv soon joined her as the shop thrived. On his deathbed this month, Viv likened Lacquer chest to “an oil well, a small one.” He would scour the dozens of junk shops abounding in the London suburbs. His love of engineering led him to specialise in rise and fall lighting. His military links fed his interest in campaign furniture. It was during such buying trips that he unearthed a previously unknown red washstand by William Burges in a Philips secondary sale in Lisson Grove. It is now in a public collection. 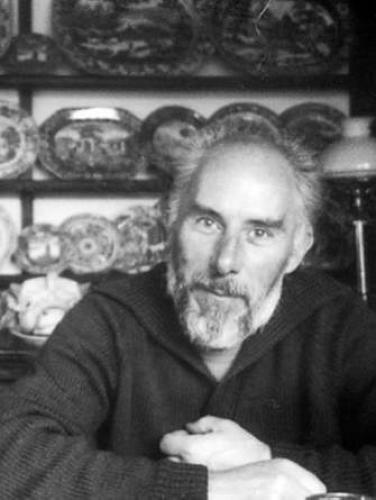 In those early years he also bought two clocks by Charles Rennie Macintosh, giving one of them to his son Toby. All of this at a time when Arts and Crafts was unconsidered like so many great dealers before him, Viv was ahead of his time. But Viv was just as happy pootling about in the little workshop at the back of the shop. He used to joke “if a jobs worth doing, it`s worth doing badly!” He was one of the original upcyclers. Turning wooden lavatory seats into mirrors and verdigris ballcocks into pawnbrokers` signs. He invented the caustic tank, and the shop sold stripped pine for many years. He continued to buy, always the ultimate customer for a 2` 6” military chest, always standing at the back of a country auction room to bid for an obscure lot. But somewhere along the way his enthusiasm dimmed. His family will tell you, part with love, part with despair, that Viv never grew up. He would much rather be hang gliding over the south downs, windsurfing on the English Channel or playing tennis with his friend Brian Ferry, as he did until September of this year. For Viv it was never about the money, something about the money appalled him. He loved white loggerhead turtle shells but he lost heart when the price went over 7/6. When Gretchen once paid me £2200 for one, we both thought he was going to combust. Viv was a great optimist. He didn`t make judgements about people which is why he had so many friends. This quality was good for antiques dealing, both buying and selling. People trusted him and liked him immediately. To young dealers he was especially generous. When I was first in Arundel he took me to the Isle of Wight where he introduced me to the dealers. They all called him Mr Andersen with a certain reverence. He made me peer through a letter box in Union Street, Ryde, to see a flight of hundreds of mahogany apothecary drawers, discarded in the side corridor of a chemist shop. He had been trying to buy them for since the 1950`s. I peeped in on them for the next thirty years, but last summer they had gone. Although often affronted by Gretchen`s buying, Viv would still come along later to pick up. Even in his eighties he would haul a heavy dresser base onto the roof of the latest ageing Volvo estate rather than pay a carrier. He dressed with understated style. His tailor was the Oxfam shop just down the road from the auction room in Worthing. Viv was always careful with money. Vivian Andersen was born in Nanital Hill Station, India on August 13th 1927. His mother Esme`s family, the Herseys, were fabulously wealthy. Viv remembered hundreds of acres of their own land as well as their own elephants. His father, Freddy, was Colonel in Cavalry who lost all interest in the British Army when it switched from horses to tanks. When Viv was five the family returned to England, wintering in Hampstead and spending their summers at the Meynells` intellectual commune at Greatham in West Sussex. At sixteen Viv joined the Royal Naval Academy at Pangbourne, but disliking the strict regime and cold showers, quickly transferred to the Merchant Navy. It was a bizarre incident during the second war which Viv always said started him on the road to dealing. Aboard the Liberty ship SS Samson, sent to China with a cargo of belts and lipsticks, Viv was about to throw overboard a pair of his old shoes. “Johnny, Johnny how much you want for shoes?” came a cry from the dock. A deal was swiftly concluded exchanging a mah jong set for the discarded shoes. The dealer was born. Back in England, Viv was recruited as assistant to Jasper Maskelyne, the great wartime magician. Viv thus saw out the last days of the British music hall dressed as a china man. This curious career was followed by one still more curious, a spell as manager of a synchronised swimming troupe who toured the lidos of the south of England. Next stop was Regent Street Poly where he gained a degree in Civil Engineering. He went on to work for Ove Arup the global firm of consulting engineers and assisted with the designs for the Royal Mint. He met Gretchen when the London taxi she had bought for £50 broke down. Always perfectly mannered, Viv stopped to help and accompanied her to a nightclub in Swallow Street off Piccadilly. Viv is survived by Gretchen and their three children, Emily in photography, Ben in property and Toby in music. He died, after a battle with cancer, at four am on a Saturday morning with his family around him. At 6 am Gretchen, in an act only understandable to true dealers, went to Portobello antiques market. She bought the best Noah`s Ark she had seen for years. I don`t know how much she paid but you can be certain Viv wouldn`t have given more than 7/6. This obituary appears in todays Antiques Trade Gazette.